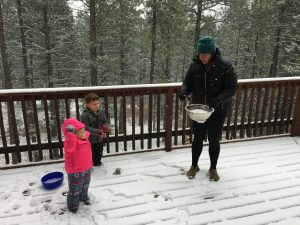 Any reasons to post a photo of my cute family is a good reason … and we were building snow people this day in New Mexico, which as I recall turned into a snowball fight. In the last couple of days and in multiple conversations, I’ve used the snowball metaphor as a way to describe where I am currently — Starting Again — and for how I’m approaching what comes next. You get the idea of the snowball …. it starts with just a small ball of snow clumped in your hand. Rough and crude it starts slow and seemingly insignificant but with sustained effort builds and builds to something bigger and better. It’s how I think about building anything because everything of worth and value has to start somewhere … but the ultimate goal is to build forward momentum and inertia, where the snowball can eventually get even bigger with less effort but also with help from others. But that left me a little behind where I would have wanted to be currently. Although I’m not starting from scratch, I’ve got a lot more work to do than I think I needed to do building this new snowball because I hadn’t properly built another one alongside it. For starters, I am focusing on building a snowball I’ve had for years — my personal brand and relationships and audience. I did use and leverage my personal brand where it fit and helped my previous business over a decade — and by doing so was also building it simultaneously. And it was effective even though some cautioned me of attaching too much of my persona in the business. For instance, when I got asked to speak in our industry, WordPress, I dove in because I knew where I went, so did the business. Then eventually I sought out those opportunities, not because I just relished being a public speaker, but because it had benefit to the snowball. But my personal brand eventually became additive to the other main bigger snowball that had my sustained focus, energy and effort for so many years. And honestly for good reason. I don’t live in regrets or try to wallow in mistakes. But I’ll use this experience and knowledge as I create my next thing and continue to nurture my personal brand as my base, my hub. Always. So that I can start again down the road in a better place. For example, I have a few hundred emails subscribers here … not a carefully curated and targeted audience of thousands to build from. That’s what I’m working on now. Clicking Publish, chasing themes, finding a new audience to serve for starters through my personal brand. And specifically, I want to build a platform or platforms. And my personal brand is currently my default starting place. I say platform very specifically because my mindset is that I want a platform that I OWN, perhaps forever, and OUT of which can produce useful and needed and profitable things. Because I sold my platform. And didn’t properly build another one in parallel. Two good examples of what I’m talking about and seeking to do now are (1) my friend Syed Bahlki of WPBeginner and (2) Brian Clark of Copyblogger fame. Both have deftly used either a main platform and/or their personal brand as a powerful place to launch multiple successful endeavors. With that in view, this time I won’t let my personal brand and platform drift off in neglect. I’m talking about snowballs and platforms so much here because I deeply believe in them. I’ve seen how they work and their effect. And I want it again. I know how much incredible work they take early on to build into something significant and impactful and yes profitable later. And once they get going they are a force. For instance, once we got iThemes up and rolling after the first year or two, it was much easier to start new snowballs within it, which also kept me interested. So we launched a bunch of things out of that one, some flopped, but a couple hit big time. One was BackupBuddy, another was our Training division, and then eventually iThemes Security (which already had snowball momentum because we acquired it with hundreds of thousands of installs). So I know first-hand … the things I’m doing or starting today will take years perhaps to gain the momentum that I want or intending. And they won’t take just time they will also take focus and care. It’s the late night pings or followups. The chasing down of tasks. Hitting publish. The searching for and experimenting of new things and the failure and learning that follow. The flow of good conversations with good people. Over and over and over and over. Until the snowball starts to roll mostly by its own momentum. That’s what leads to success. And I’ve got countless examples of it. It is this early tireless, thankless toil of snowball building that is the magic that comes later. That first ugly clump can become something. With work. The sweaty, gritty hard work starting, building, maintaining something so one day the snowball is rolling almost on its own BECAUSE of all that hard work and sleepless or late nights NOW. So I don’t take this season for granted. It’s imperative to the success of what comes next for me, which is why I’m finding myself going back to my roots and beginnings of starting the snowball. I know they work … with enough care and effort. Consistently. Deliberately. Building the snowball. Even though the work is hard I remembered … I really like starting snowballs. This time, however, I’ve got some snowball lessons to do it again … just a little bit smarter. How about you? I’m curious, what stage is your snowball in? This is such a great analogy, and I love that you brought up the idea of building a second snowball once your first one is already in full swing. It’s been great to watch your journey, and I know I sent congrats when I first heard the news of iThemes – but it’s much deserved congrats, so yay! Thank you, Nathalie! I keep seeing great things from you, in fact, have one of your posts up to read for my next snowball!